The New Year is a new opportunity for anyone who wants to make their dreams of making it as a professional footballer come true. The Pro-Direct Soccer Academy is looking to recruit the next generation of footballing talent in the UK. Many players with the potential to make it as a professional may have felt that they missed their chance to do so in 2012. 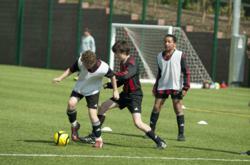 However the Pro-Direct Soccer Academy offers a second chance to aspiring footballers with space on a number of coaching courses now available in 2013. The Academy has been founded by a number of FA and UEFA qualified coaches, former professional players and scouts from Premiership, Championship and Football league teams. It has been created to help develop the next generation of footballing talent in the UK and works with players from the age of 6 and up. It also aims to give players who may have slipped through the usual scouting networks or been released by their club another chance at making it is a professional. There are a range of courses now available at academies throughout the UK. Courses range in length from 1 week to 1 year and focus on providing players with all of the skills and abilities they need to make it in the professional game. All courses are run by UEFA and FA qualified coaches and provide structured and intensive training as well as the opportunity to impress scouts from professional teams in the UK. Equal attention is given to off the field activities with an emphasis on proper fitness and nutrition and a full range of academic opportunities. More information about the football trials and coaching courses is available from the Pro-Direct Soccer Academy website. The Pro-Direct Soccer Academy is a football organisation with a difference. Not only does it work with young footballers aspiring to be professionals it works with a range of junior teams, Community groups, schools within the special needs sector and other educational authorities. It offers a range of football trials and courses for players of all ages and abilities and more information can be found on their website.